QNAP®, Inc. today announced the availability of QTS 4.1.1, the new Turbo NAS firmware that features whole-NAS encryption by volume-based technology to greatly ensure data security in response to increasing cloud security challenges. As the fear of private data being leaked over the Internet is now a prime security concern, the protection provided by Network Attached Storage (NAS) has received great attention, especially for confidential business files and private photos/videos that require high security. However, the shared-folder-level encryption found in traditional NAS does not allow users to encrypt photos, music and videos stored in default shared folders, and therefore can lead to data being easily accessible if the NAS is stolen. For business users, QNAP provides a unified storage solution with both security and functionality. Even if the Turbo NAS is encrypted, all the files can still be accessible via Windows SMB/CIFS, iSCSI, and NFS protocols. In contrast, some NAS brands only allow users to encrypt newly created shared folders, and thus they will not be able to access these shared folders via NFS protocol, resulting in great inconvenience. 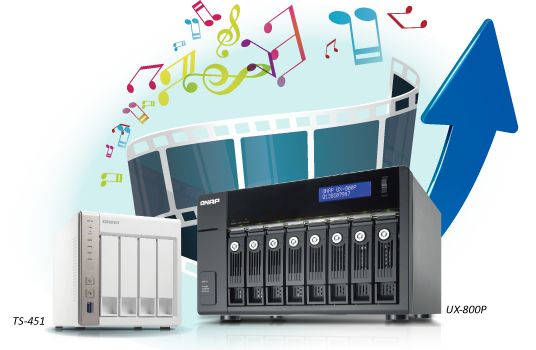 With whole-NAS encryption, QNAP offers Turbo NAS users 100% security and a convenient private cloud storage solution. 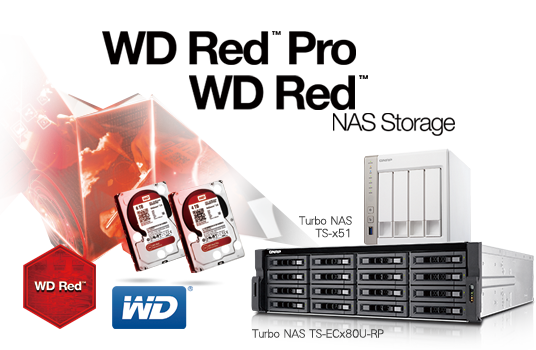 QNAP® Systems, Inc. today announced the release of the new tower-based Turbo NAS TS-x53 Pro series (available in 2, 4, 6, 8-bay) and the 2.5”-drive SS-x53 Pro series (4 and 8-bay) that provide a powerful and reliable solution for data storage and mission-critical business applications for small and medium businesses. Coupled with exclusive QvPC Technology, these new series can serve as cost-effective PC substitutes that enable direct access to stored data, real-time surveillance monitoring with local display, XBMC digital entertainment, and more. The TS/SS-x53 Pro series is powered by a quad-core Intel® Celeron® 2.0GHz processor with burst speed up to 2.41GHz and 8GB/4GB/2GB energy-efficient DDR3L RAM (expandable to 8GB), supports 2 or 4 LAN ports that provide up to 400MB/s read & write speeds in port trunking mode, and achieves 70+MB/s read & write AES-256bit encryption performance. “The new models deliver high performance that maintains smooth system operations even during intensive data access,” said Jason Hsu, product manager of QNAP. “The high-quality hardware also provides the power for users to operate multiple virtual machines using QNAP Virtualization Station, transcode Full HD videos in real-time or offline, and enhance their business productivity with SMB features built-in,” added Hsu. 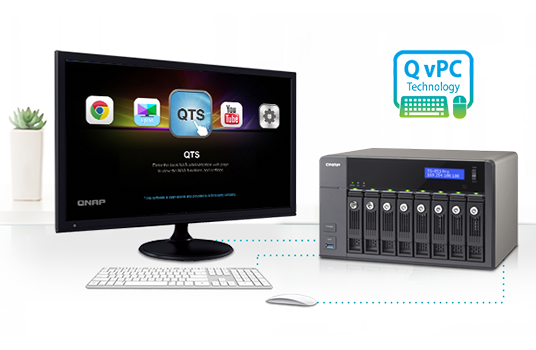 QNAP’s exclusive QvPC Technology consolidates a number of high-end technologies including VM integration, multimedia transcoding, HDMI output, cloud integration and NAS connection technologies, allowing users to operate the TS/SS-x53 Pro series as a PC when they plug in a keyboard, mouse and monitor. With QvPC Technology, the TS/SS-x53 Pro series is transformed into a cost-effective device with PC functionalities for users to directly access stored data on the NAS, run multiple applications using Windows/Linux/UNIX/Android-based VMs, surf the web on Google Chrome, enjoy Full HD videos with up to 7.1 channel audio with XBMC, monitor the Surveillance Station in real time with local display, and much more. Users can install the Virtualization Station from the QTS App Center to extend the functionality of the TS/SS-x53 Pro series by operating multiple Windows, Linux and UNIX-based VMs. Virtualization Station offers numerous functions including snapshot, VM import/export, dedicated LAN ports, user permissions, and more. Users can conveniently operate VMs as remote desktops via web browsers for instant management or troubleshooting. The TS/SS-x53 Pro series, with integrated hardware acceleration, provides superior real-time and offline Full HD video transcoding capabilities to convert videos on-the-fly or in the background to universal formats that can be smoothly played on computers and mobile devices. In the event of limited Internet bandwidth, users can still enjoy smooth videos by selecting lower resolutions to play the videos via File Station, Video Station, or the Qfile mobile app. The TS/SS-x53 Pro series allows multiple users to simultaneously watch different videos stored on it without affecting the performance of other running applications. “This powerful transcoding feature makes the new series perfect for organizations where videos are at the heart of their daily work or digital offerings, increasing their productivity and providing higher-quality videos near-instantly,” added Hsu. The TS/SS-x53 Pro series has a range of comprehensive business applications and is ideal for SMBs to build a secure private cloud. It supports VMware®, Microsoft® and Citrix® virtualization solutions to simplify virtual storage management. The cross-platform file sharing for Windows, Mac, and Linux/UNIX users makes the TS/SS-x53 Pro series an ideal centralized storage solution for organizations with a large number of users. The support for Windows AD, LDAP directory services and Windows ACL improves the efficiency of permission settings. The TS/SS-x53 Pro series can also act as a domain controller for Windows, and offers flexible backup solutions for Windows® and Mac® users and disaster recovery solutions including RTRR, rsync and cloud storage backup. The IT Management Station (powered by Mandriva® Pulse) provides an IT system management solution for businesses of all sizes to centrally manage multi-OS and multi-site IT assets. With the unique Signage Station, business users can easily create animated content and advertisements for promoting their services. Featuring a scalable design, the TS/SS-x53 Pro series allows administrators to connect a QNAP expansion enclosure (UX-500P or UX-800P) to increase the total storage capacity to 96TB with multiple volumes (varies by models). The UX-500P and UX-800P tower expansion enclosures offer SMBs with budget-friendly options to expand their storage capacity on demand to fulfill storage-intensive applications such as video surveillance, data archiving, TV broadcast storage, and for backing-up the entire content of the connected Turbo NAS.